1. I am a long-term transitioner. More specifically, I am transitioning from severe heat damage. 2. I generally do not agree with "hair typing". 3. I am a product junkie. I felt it was important to lay those things out as a caveat of sorts, just to make it abundantly clear where I and this article are coming from. 17 months into my own natural hair journey, I have successfully grown tons of new curls without serious breakage or other damage. I still have some straightened/loose heat damaged ends, so it is important that the products I use are able to treat my curls right without drying, damaging, splitting, or otherwise harming my delicate ends. Or making them look like a pack of wet Ramen. As a transitioner, I fundamentally disagree with hair typing, as it is a dangerous bandwagon to hop on. Not because its divisive and has discriminatory undercurrents, but because it is difficult for someone who has transitioned for less than a year to fully understand their new texture. But as I write, explore, and grow, I understand the human need to categorize and label - whether it be by type, texture, length, porosity, density, or otherwise - to understand and identify products and practices that are helpful on an individual level. Lastly, I am a product junkie. I don't pretend to slap that "recovering" label in front of it anymore, because it just is what it is. I love exploring products, ingredients, trial and error, mixes and matches, and most of all, successes. My product junkie-ism is even moreso fueled by my Small Business Pledge. So for anyone looking for a DIY article, the isn't the one. Now that we've got those disclaimers out of the way, let's get to the good stuff! The 411: Get Set Hair Jelly is an aloe based gel that works at fighting frizz and humidity while giving curls super definition. Of all the gels out there, Get Set Hair Jelly easily provides the longest lasting results. I got 4 day hair without even trying. If you find yourself having difficulty getting curls and coils to clump and define, give this product a try. A word of caution: don't be super heavy-handed. Too much product can lead to somewhat crunchy hair. A little bit goes a long way! The 411: As I Am Smoothing Gel is water and aloe based, providing a firm hold without hardness and flaking. Although As I Am Smoothing Gel is typically used to sleek edges, I've found that it is a legitimate contender in the wash n' go world. It is pretty thick, so it works best and spreads the easiest on wet and damp hair. You will achieve great definition and hold on your curls and coils! The 411: Goddess Curls came as a shock to me. I was never really interested in their product line, until Sally's ran a buy 2, get one free promotion in July. But now I'm hooked. This liquid gel is fragrance free (great for those with sensitive sniffers), water based, and glides easily through wet or dry hair. Curls are super defined and sculpted, every time. Just go easy and make sure you don't get too-too heavy-handed. There is a great potential for the crunchies, so show some restraint! The 411: Of all the products on the list, this Curl Enhancing Custard is one of my hands down favorites. Everything in the Obia Natural Hair Care line is formulated by Obia herself, a trained chemist. This Custard is water and olive oil based, providing softness, shine, curl clumping, and definition without an ounce of stiffness or crunch. This is a feat, because I am heavy-handed with products. I can't say enough about how much I love the Curl Enhancing Custard. The consistency is similar to As I Am Smoothing Gel, but doesn't contain as many fixatives, making the hold a little softer. The 411: Purgasm Shop's Wild Cherry Curl Poppin' Gel is an amazing gel for those seeking medium hold, no crunchies, and love botanicals. The Gel is based in water (infused with marshmallow root, wild cherry bark, flaxseed, and more) and aloe vera. The consistency reminds me of DIY Flaxseed Gel, but it smells a whole heckuva lot better. It spreads easily on wet or dry hair, making it an ideal product to rake through curls and coils. The 411: First of all, I can't believe I'm even putting Miss Jessie on any list for anything. Her price point kept me away long enough to explore other options. But when the opportunity to get free samples of the new Jelly Soft Curls arose, I figured I would be a fool not to. To my surprise, I rather liked the gel. It's devoid of artificial colors (which deviates from Miss Jessie's other products), and the fragrance is rather mild. It provides a moderate level of hold while imparting shine, with a similar consistency to EcoStyler. No crunchies here, but also no real frizz protection. The 411: Boing! is the latest creation to come out of the Oyin Handmade kitchen. Literally. As in, it just came out on August 10th. With a thick icing-like texture, it is designed to moisturize and define curls all in one step. It smells great, has a creamy feel, and it almost seems like no matter how much you use, your curls will never get hard. It is based in water and shea butter, and guaranteed to give you soft, touchable light definition. The 411: This water and coconut oil based product is guaranteed to give you moisture and light definition. It is a great moisturizing base for a wash n' go or other style, but also stands alone as a soft curl definer in it's own right. 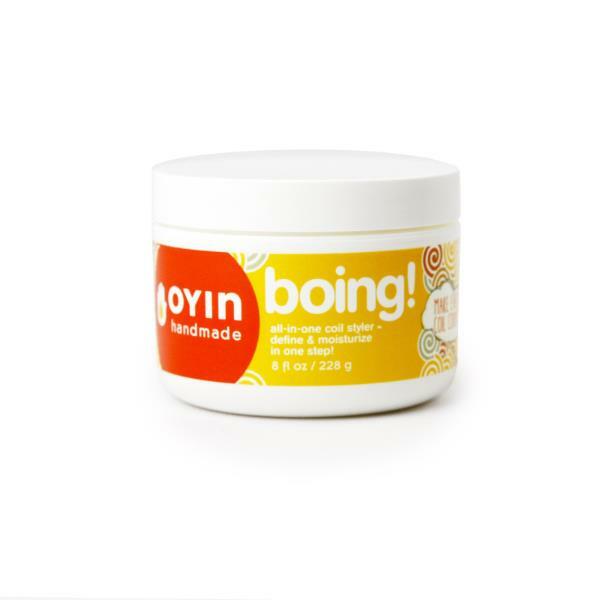 It is a little heavier than the Coconut Shea Pudding Souffle, but won't make your hair feel like it is full of buildup. You can be heavy-handed or go light with this product, and still get good definition. This list is by no means definitive! If you have a favorite curl defining product, shout it out! I'm always on the prowl for great products!